Jadoo Box is an offer of PTCL which provides continuous internet connectivity by using landline DSL as primary connection while Evo wireless device as backup. Evo will be used as backup channel in times when regular DSL connection is not available. This service was introduced earlier this year. Now this has become most reliable internet service in Pakistan with virtually hundred percent connectivity. You will be able to connect your desktop with DSL and with Evo during non-availability of DSL, your connection will be automatically switched over to wireless connection when land line is out of service. While you can enjoy WiFi connection for your laptop or smartphone. Jadoo Box has also port for Smart TV. Now PTCL made it compulsory for all new 2Mbps and above connections. 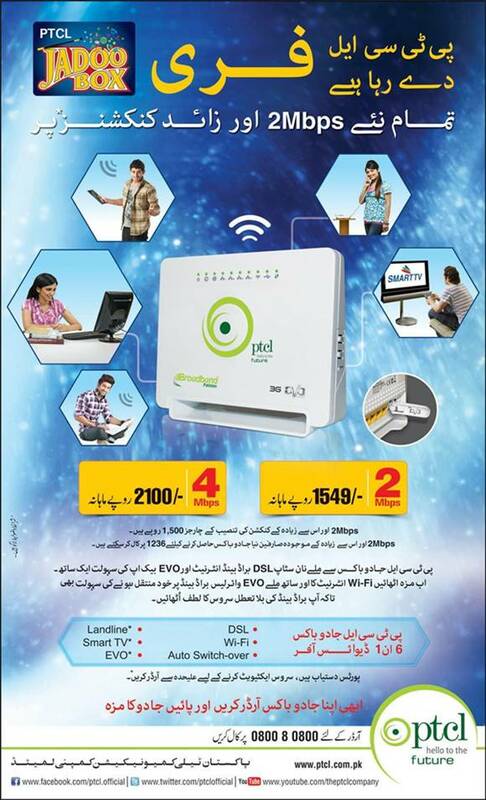 Existing customers can also avail this service by calling PTCL Helpline on 1236. Jadoo Box is optional for customers with speed lower than 2Mbps. Rs. 1,000 extra will be charged in case customers with speed lower than 2Mbps want Jadoo Box in place of the normal DSL Wifi Modem.